The EU heads of state are meeting for a European Council meeting on 28-29 June. 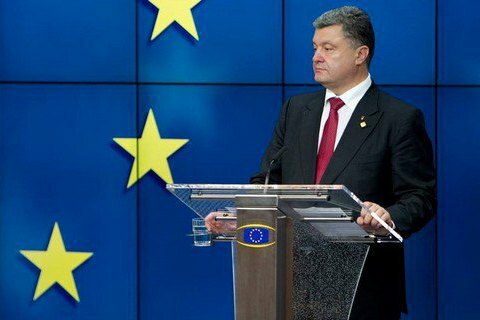 Ukrainian President Petro Poroshenko on 27 June took part in high-level political consultations between Ukraine and the EU with participation of the Presidents of the European Council, European Commission and European Parliament in the framework of the so-called Ukraine-EU mini-summit, according to Poroshenko's website. "The issue of sanctions against Russia has been discussed in details during the meetings with the EU leadership," he said and emphasized that sanctions against the country-aggressor must be continued. 'This decision is extremely important for us and we should efficiently work over this issue until the last minute," Petro Poroshenko told journalists following the consultations. "We expect positive messages following the EU summit and the European Council's session tomorrow. It was crucially important to convey present information on the implementation of the Minsk agreements and problems of the occupied territories today, as well as deliver clear position of Ukraine," the president emphasized and expressed confidence that the decision would be positive. At the same time, Petro Poroshenko noted that Ukrainian diplomats should continue their work for the continuation of sanctions. "We are sure that we have been heard and the decision will be positive. But we cannot say that everything has been already decided. We should fight until the last minute," he said. He noted that the summit was very symbolic because the EU institutions continued functioning even after the UK referendum.